The latest images snapped by the Cassini space probe reveal the magnificent blue-green surface of Saturn's strange moon, Titan. NASA’s Jet Propulsion Laboratory, the European Space Agency, and the Italian Space Agency have just released a stunning new image of Saturn’s bizarre moon, Titan. According to a report from Discovery News, the composite photo taken by the Cassini space probe is one of the first to show the surface of the moon. The topography on Titan is filled with dunes that align to form the shape of the letter “H.” The photo shows the surface in the hemisphere of the moon that faces Saturn, from the Fensal region in the north to the Aztlan region in the south. Similarly to our moon, Titan is in a tidal lock with Saturn. This means that the same side is always facing towards the surface of the planet, rotating about its own axis as it orbits. The Cassini probe swooped to 10,000 kilometers above the moon on Nov. 13 as it flew by. Typically, the probe passes the surface of Titan at a height of just 1,200 kilometers, but the greater distanced allowed the probe to photograph a larger area on the moon, at a few kilometers per pixel. According to NASA researchers, the photo suggests that Titan has been shaped by similar processes that form the topography here on Earth. The photo reveals tall dunes separated by river channels that drain into massive lakes. Titan is the only moon in the solar system that has a dense atmosphere. The lack of craters from meteorites on the surface of Titan suggests that the features were formed relatively recently. Wind and liquid erosion are continuously reshaping the surface from above, and tectonic forces from below. 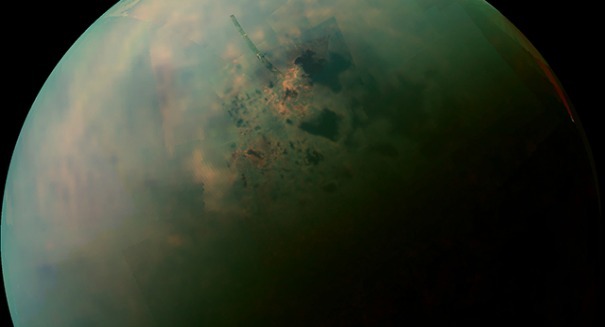 Despite its geomorphic similarities to Earth, Titan would be rather inhospitable to life. The surface of the moon is -179 degrees Celsius, and the sand is made up of dark hydrocarbon grains. Methane falls from the sky in liquid form, and water ice composes many of the solid surfaces on the strange world. Titan’s atmosphere is primarily made of nitrogen, and the rest is made up of methane. The abundance of organic molecules on Titan make it an interesting candidate for studying how life could have formed on Earth, but the conditions on Saturn’s moon are too cold for the necessary chains of reactions to begin. A press release from NASA’s Jet Propulsion Laboratory describing the new image can be found here.